Ultrasonic reflection tomography enables to estimate geometrical shape and dimensions of non-uniformities inside solid objects. One of the most widely used algorithms is an approach based on the back-projection along circular arcs. In the case of immersion testing and non-planar boundaries the efficiency of this algorithm is not sufficient for practical applications, because quality of the images obtained is rather low due to refraction of ultrasonic waves. The main objective of this research was to develop a novel tomographic reconstruction procedure suitable for immersion testing of objects with curved boundaries. Tomography is the method of image reconstruction from projections. In the ultrasound reflection tomography the projection is defined as an integral of a reflectivity function along circular arcs, the center of which coincides with position of the center of the ultrasonic transducer used for testing . Such an approach is valid under assumption that the ultrasonic wave is spherical wave, e.g., is radiated by the point type source. In the case of objects with non-planar boundaries these wavefronts are significantly distorted, what results in a reduction of quality of tomographic images. Especially significant distortions of ultrasonic wave fronts take place in the case of immersion testing of metallic objects. In this case it is not clear whether the arcs along which the backprojection should be performed are circular or not. Also, even if the circular approximation is used, the centers of these arcs do not coincide with the position of the ultrasonic transducer . In addition to the front distortion caused by refraction, mode conversion phenomena also complicate reconstruction process and reduce a quality of images. If for tomographic reconstruction non-accurate values of the main initial parameters, such as position of the center of the corresponding arc, curvature radius of the arc, shapes of the arc are used, that results in a loss of sharpness and distortions of the reconstructed image. These distortions are accompanied by errors in determination of absolute coordinates and geometry of the reflectors. In order to increase accuracy, the back projection must be performed not along previously determined arcs, but along the arcs coinciding with wave fronts at a corresponding depth (Fig.1). 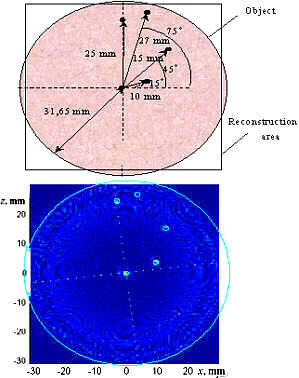 Therefore, the main problem is to determine the fronts of ultrasonic wave in a reconstruction area inside the object. This causes the need of the wave front determination. In the case of solid objects it is not a trivial problem, because the measurements may be performed only outside the object. Fig 2: . Ultrasonic field radiated into an immersed cylindrical specimen by a circular ultrasonic transducer (f=5MHz, D=5mm). Solid lines denote the reconstructed wave fronts. The wave fronts can be reconstructed or from the measurements performed in advance on a test sample or from simulation data . Advantage and disadvantages of both approaches are the following. Determination of the wave fronts using experimentally collected data are complicated because there are no methods of direct measurements of acoustic fields inside solids. In this case wave front in a vicinity of the reflector may be reconstructed from the signals measured on the external surface of the object under a test . If there is no possibility to perform experimental investigations the wave front can be determined from simulated data. The main requirement for such a model is possibility to simulate propagation of ultrasonic waves in a few media separated by curved interfaces. These simulations require a high accuracy, especially in the time domain. 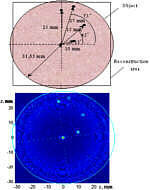 For this purpose the method based on the well-known model  for calculation of fields, radiated by a circular transducer has been developed [6,7]. This method was extended for the case of two media, separated by a planar or cylindrical interface. This approach is based on assumption that the Snell's law is valid for each single ray. 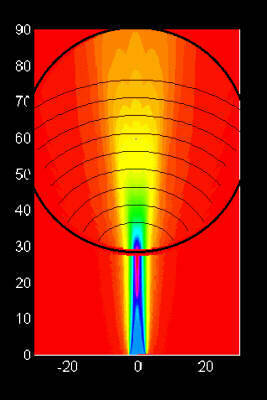 The propagation path of a particular ray through the cylindrical boundary is found using special non-linear procedure . An example of the ultrasonic field calculated using the developed method and the reconstructed wavefronts are presented in Fig.2. The variations of the arcprojection parameters for the analyzed case are presented in Fig .3. From the results obtained follows that these variations are significant and should be taken into account. tomographic reconstruction along the determined wave fronts. Experiments were performed with a special cylindrical test specimen, immersed in water (Fig.4a). The test sample was manufactured from brass. As reflectors five 2mm-diameter side drilled holes located at different distances from the surface were used. The reconstructed image of the test sample is presented in Fig.4b. The results obtained indicate a good performance of the proposed reconstruction procedure. In spite of the fact that the presented investigation is performed using immerse technique, in principle it can be applied for the contact non-destructive estimation also. Kak A. C., Stanley M. Principles of computerised tomographic imaging // New York: IEEE Press. 1988. Jasiūnienė E., Maeika L. Reconstruction of ultrasonic wavefronts from the field of circular transducer // Ultragarsas. 1997. Nr.1 (27). P. 11-15. Jasiūnienė E., Maeika L. Transformation of ultrasonic wavefronts on the boundary liquid/solid // Ultragarsas. 1997. Nr.2 (28). P. 12-16. Kays R., Maeika L., Jasiūnienė E. Application of ultrasound reflection tomography for non-destructive evaluation of objects with a complex geometry // J. Acoust. Soc. Am. 1999. Vol. 105 No.2. (2). P. 1360. Jasiūnienė E., Maeika L. The modified method for simulation of ultrasonic fields of disk shaped transducer // Ultragarsas. 1999. Nr.3 (33). P. 33-37. Maeika L., Kays R.-J., Jasiūnienė E. Ultrasonic reflection tomography of the objects with non-planar boundaries // Bollettino di Geofisica teorica ed applicata. (An International Journal of Earth Sciences). Trieste. 1999. Vol. 40. No. 1. P. 112.